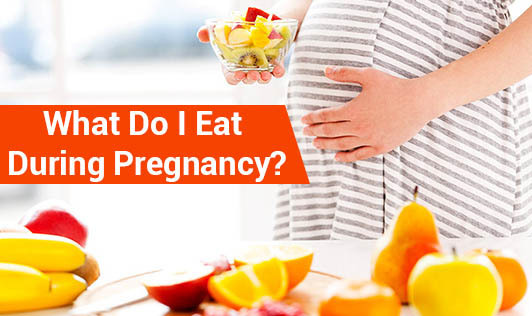 What Do I Eat During Pregnancy? • Protein: It is not just important for body building, but more important during pregnancy, as the amino acids present in proteins form the building blocks for both you and your baby! Protein rich foods also keep your hunger at bay, quash a few junk carvings and most importantly, keep the blood sugar stable! A few protein sources are dals, whole grams, lean meat, eggs, beans, nuts and dairy products. Lentils, especially rich in folic acid are also important to prevent spine disorders in babies. • Calcium: Most women have this misconception that calcium is essential only for post menopausal women. But calcium is equally important for your baby's bone growth and to keep your bones strong. Calcium also helps in nerve and muscle functioning. So, if coffee (with milk) is the only source of calcium in your diet, add more spinach, yogurt, oil seeds and other dairy products to improve your calcium intake. • Flax seeds: The much hyped flaxseeds are indeed packed with nutrients and also essential during pregnancy. Rich in omega-3-fatty acids, flaxseeds help in better development of the eyes especially the retina and the brain of your baby. How about sprinkling flaxseeds on your salad/yogurt or adding flaxseed powder to your cereal? You can also substitute flaxseeds with walnuts, avocados or salmon to get these essential fats. But remember, moderation is the key as they are "fats". • Colored fruits and vegetables: Colored fruits and vegetables are the best for you and your baby. They are rich in beta carotene that is critical for the baby's skin, eyes, bone and organ development. • Popcorn: Yes, you heard it right! Choosing popcorn is the best way to improve your whole grain intake. It also helps you deal with constipation and helps quell nausea. As understood, it is also rich in fiber. So you now know what can be your "today's healthy evening snack" recipe. • Water: This is always given the least priority, be it during or post pregnancy. Good fluid intake is necessary for good hydration which is very essential during pregnancy as it helps in cell growth of both the mother and the baby, delivers nutrients, flushes toxins out of the body and also reduces the risk of early labor! Do not eat for two from the day you get to know that you are pregnant! Slowly start increasing your intake with every trimester. If you are staring your pregnancy with a healthy weight, then you need only 300 calories extra which is equal to a cup of skimmed yogurt and four slices of brown bread. If you are overweight, you need lesser than this. If you have multiple babies or are underweight, then you may need a little extra. Confused? Why not consult your Dietitian today and know how much to eat!